First the news – Bburago is moving more upscale with its Signature Series. Even bigger news, Bburago again has the license to create Ferrari models and has a full line for 2015 and beyond. Bburago began as an Italian die-cast car maker 40 years ago when the Besano brothers created Martoys. Production took place in Burago di Molgora in Italy’s Monza province. In 1976 the company was renamed Bburago, combining the B from the brothers’ name with their plant’s hometown name. Now the May Cheong Group of China owns Bburago along with its other noteworthy die-cast brand, Maisto. 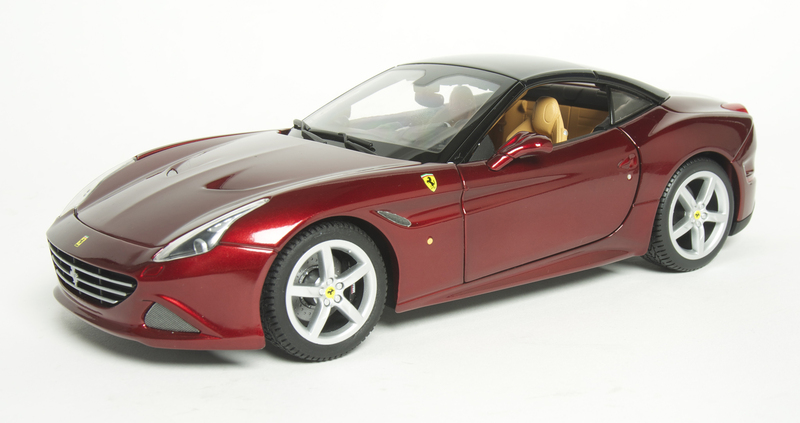 That’s the corporate history lesson, but the big deal is that Ferrari is back in the fold after 15 years and by way of celebration Bburago has created a 1:18 scale Ferrari California T in a striking dark metallic red with black roof. And it moves well beyond toy to collectible.